10% inspiration, 90% interesting pantry contents. I'm pre-emting the bread recipe I promised for today to post this recipe. The bread will be tomorrow's post. I promise. I love a challenge – especially in the kitchen. We are still unpacking after our move, and we didn’t have time yet to go to a grocery store. So we’ve been relying on the pantry and freezer. The night I made this I did some pantry foraging. What I found was a bit disappointing. Frozen shrimp and a can of soup. It was the most obvious combination that sprang to mind from what I initially saw. That was my departure point. The inspiration for this dish came from a can of condensed cream of mushroom soup. I really dislike using canned soups in dishes if it’s avoidable. This time it seemed I was destined to have something like mushroom soup bake. 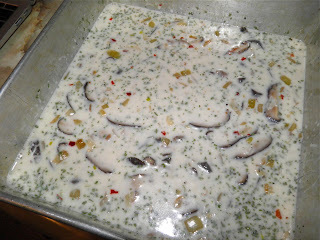 While I was bemoaning the fact I had no mushrooms to make my own "soup base" it dawned on me I actually did. They just weren’t fresh. I had dried shiitake. The dish swiftly started to veer towards Thailand. Chilli flakes, cilantro, lemon, fish sauce, ginger... 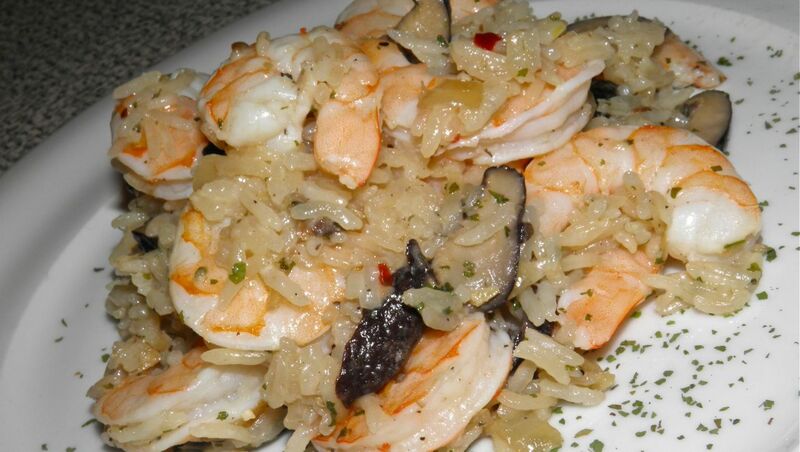 The preparation could even stay the same as mushroom rice bake. Just switch out what goes in it to Thai flavours. The baking directions came straight from Campbell’s (regarding time and temperature), but the rest of this recipe is completely re-imagined. This is essentially a Thai version of that awful cream of mushroom soup rice bake. This delivered more than success. This will now be among the go-to recipes for whenever we have company and want to sit with them rather than fuss in the kitchen. It’s amazing what you can pull off with hardly any effort and a little inspiration. Always go where there is no path. Blaze a trail! Preheat the oven to 375°F. 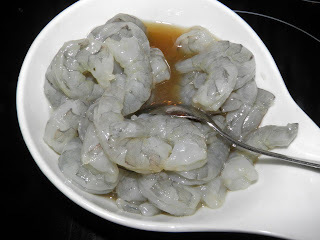 Heat the sesame oil in a skillet. Sauté the onion, garlic and ginger until softened. Slice the shiitakes and add to the pan with the reserved soaking liquid and the chilli flakes. Cook on high until the liquid has evaporated. Cook for a further 3-4 minutes until the mushrooms start to brown slightly. 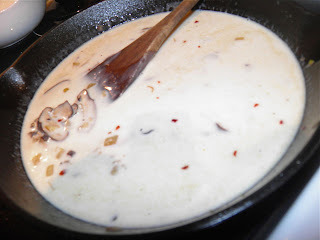 Remove the skillet from the heat and stir in the coconut milk and milk. Then add salt and pepper to taste. Place the rice and cilantro in a 9” x 9” x 3” baking dish. Pour the mushroom sauce on top and mix well. Cover tightly with foil. Bake for 35 minutes. Meanwhile, peel and clean the shrimp. 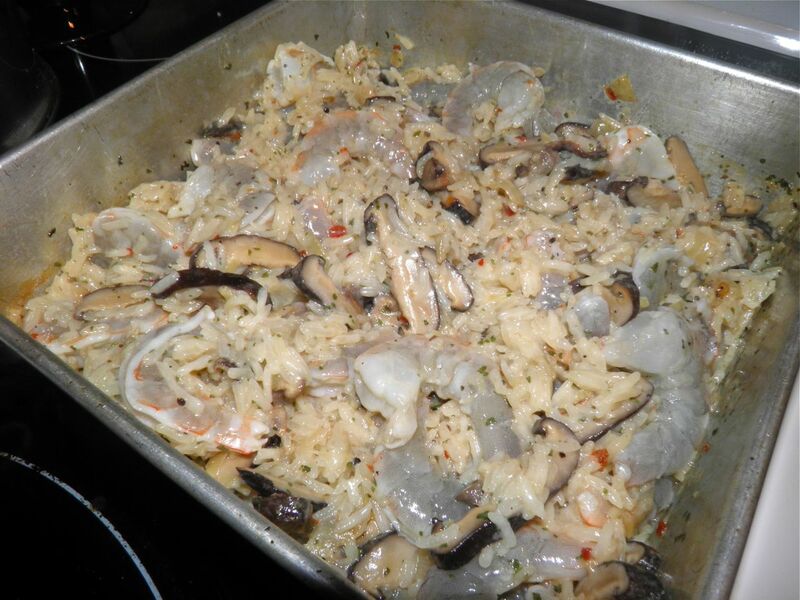 Toss with some salt, the fish sauce and lemon juice and let marinate while the rice finishes its 35 minutes baking. 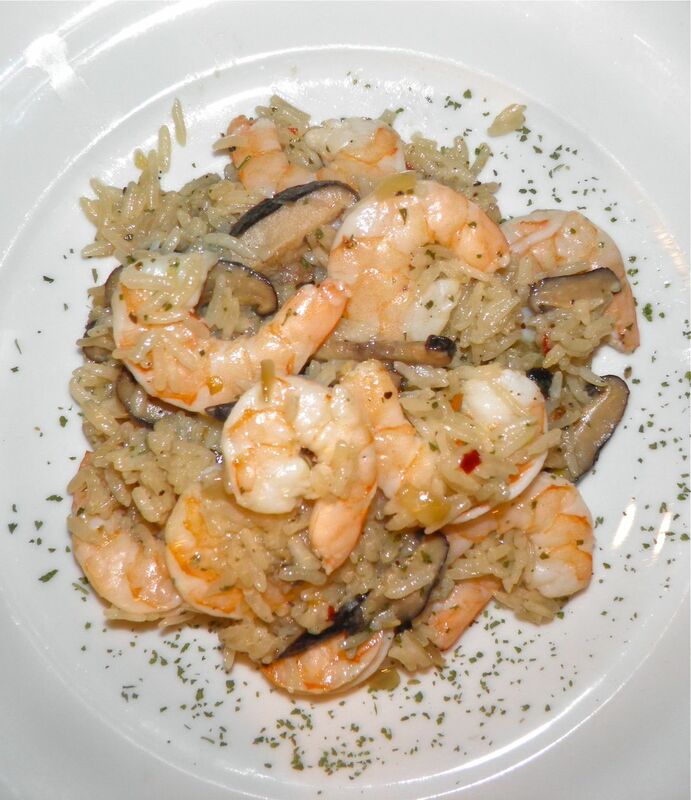 Uncover the rice, stir in the shrimp, fish sauce and lemon. Recover and bake an additional 12 minutes. Let sit, covered for 2 minutes. Serve with a sprinkling of cilantro on top.